Sometimes the simplest recipes are the ones that turn out to be the most satisfying because you get the best return on flavor for your investment of [not much] time. These bars are like that. Shortbread is a very basic kind of cookie to make that the bars are made up of shortbread, using the exact same mixture for the crust and the crumble topping. The filling is just jam and,while you want to use a jar of top quality jam or preserves to get the best flavor, it doesn’t take much effort to pop open a jar of your favorite brand. Preparation takes about 5 minutes and then the bars are ready to hit the oven. And when the bars come out, you won’t be disappointed. The shortbread is buttery and tender, crumbling easily into your mouth even though it holds its shape enough to slice cleanly (mostly cleanly; use a sharp knife!). I considered griding up the pecans into a meal, rather than just chopping them finely with my chefs knife. I actually liked the bit of texture that they gave to the bars. Pecans were probably a better choice than almonds or hazelnuts, which don’t quite have the buttery texture of the pecan, but walnuts would work well here, too. Lightly toasted, unsalted pecans were my favorite for this, although untoasted pecans will still come out well and will become somewhat toasty in the oven. Use any flavor of jam that you like. I oped for strawberry because it’s strawberry season and I just can’t get enough of the ultra-ripe berries right now. The jam I used actually came from a local farmers market. I think that the bars would be amazing with blackberry jam, since blackberries tend to have a deeper flavor than strawberries, but you could even use something like sweet-tart marmalade if you prefer. In a large mixing bowl, whisk together flour, sugar, salt and pecans, then stir in the butter and egg until mixture is crumbly, like coarse and wet sand. Set aside 2 cups of the mixture, and pour the remaining mixture into the bottom of the prepared pan. Press down gently, but firmly, into an even layer. Spread strawberry jam over the shortbread layer. Sprinkle remaining crumbs evenly over the top. If the mixture is too wet to sprinkle, simply break it up with lightly floured fingers and spread it out. Bake for 40-45 minutes, until lightly browned. What is a cake heating core? Next PostNext What is a cake heating core? These look amazing. I can’t wait to try the recipe. Trader Joe’s would definitely have some good jam to try. I wonder if macadamia nuts would give the same buttery satisfaction? I’d toast them first to deepen the flavor but I’ll bet they would be good with raspberry jam or another less sweet like boysenberry. Thanks for another wonderful recipe. 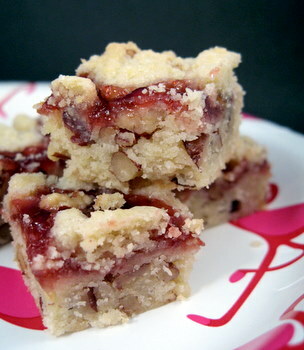 The last crumble bars with the oatmeal were a HUGE hit with friends and web community alike. Looks like they will melt in your mouth! Look so yummy! If these are anything like your coconut shortbread, they look like the same ingredients, I’ll be making them as soon as I can. The coconut bars were way too easy and so tasty. This looks like a grand variation. I haven’t made many bars, but I can see myself getting addicted to these little beauties! These look so good – Im going to have to give these a try. These bars looks fantastic. I can not wait to try them and your strawberry lemonade bars! I tried this with a few additions. I added some lemon zest and 1 TBL vanilla powder. I think its a nice tea pastry but I would not use the pecans again. Walnuts or almonds would produce more depth of flavor. For some reason unless you toast the pecans it is kind of bland. My batch needed some glaze. I used some strawberry jam i made last summer, and these turned out really well. I think my pan was a bit small, so I’ll make less dough next time. I love the shortbread cookie base. And they really only took minutes to put together. I’m looking forward to making more jam this summer to make these bars again. I made this recipe exactly as stated, with Strawberry Preserves from Trader Joes. They were excellent! Everyone at my office snapped them up. For the amount of effort put in, these definitely have maximum reward. Shortbread–my weakness! This looks delicious, and, the next time I have a nice batch of strawberries, I will make this and try not to eat it all! I made these last week and served them at a baby shower. They were great and everyone loved them. I used raspberry preserves. Will be posting them on my blog. Thanks for the great, easy recipe. I made these for my writing group and they turned out great. They were even better cold, the next day. I made these for my husband who loves shortbread and pecans. He certainly wasn’t disappointed and the plate emptied pretty fast between he and the kids. I agree with Hannah…they were even better the next day. These were incredible and easy to make. I’ll make them again and again. I used a combination of strawberry and apricot preserves, which was great. I also added a half tsp. almond extract and a half tsp. of cinnamon-sugar to the preserves. The chopped pecans add great texture and flavor to the delicious buttery shortbread. My challenge was to get them packed up to give to my daughters before I ate the whole batch. I used a slightly bigger pan and they were still a good size and worked very well. I made this quite a few times and I absolutely love your recipe! I literally just made these about an hour ago and they are fabulous! I used walnuts because I didn’t have any pecans and I used *gulp* Smuckers low sugar ( Not sugar free! )Strawberry jam. Well that just about makes me wanna head to town and buy those ingredients. That looks awesome. Long time reader, first time commenter. I made these today with a few adaptions and they turned out great, beautiful like the photo and very tasty. My alterations: reduced the sugar, added sweetened flaked coconut, toasted the pecans, used raspberry preserves, and added a layer of fresh white peaches. Yum! Next time, though, I think I would only reserve about one cup of dough to sprinkle on top– two cups totally covered up the jam layer and resulted in a thinner, less sturdy bottom layer. I used fig jam with no added sugar instead of the strawberry – was amazing! These are ridiculously amazing! I made them for my book club and 6 of us finished off the whole pan. As another comment said, for the amount of effort (low), these have a wonderful result. i found your recipe on Pinterest while searching for a bar recipe I could make without running to the store. I used some toasted almonds I had on hand along with some homemade raspeberry peach jam. I added 1/4 tsp almond extract to the dough. Next time I will reserve only 1-1/2 cups dough for sprinkling on the top. It was a bit much on top and not quite enough on the bottom. This is a great recipe to mix and match nuts and flavor of jam. I will try cherry jam with almonds next time.